V.com weekend vote: Do you use a shoulder rest? November 4, 2016, 10:09 AM · With politics raging out of control in the U.S., I thought I'd go with the flow and have a vote on one of our most controversial subjects: shoulder rests! Do you use a shoulder rest? And did you ever switch from using one to not, or vice-versa? There are physical, musical and philosophical arguments either way. As a matter of fact, we've argued bitterly about the subject in many Violinist.com discussions over the years. Why is it such a heated topic? A few reasons: Jascha Heifetz didn't use a shoulder rest; who doesn't want to be like Heifetz? Some have made it into almost a moral issue, calling a shoulder rest a "crutch." That's annoying, as most people do use a shoulder rest or pad of some kind. At the same time, many have found a wonderful kind of freedom, not using a shoulder rest. Add to this: it's easy to get neck, jaw, back and shoulder injuries when playing the violin or viola, and we all have different bodies. 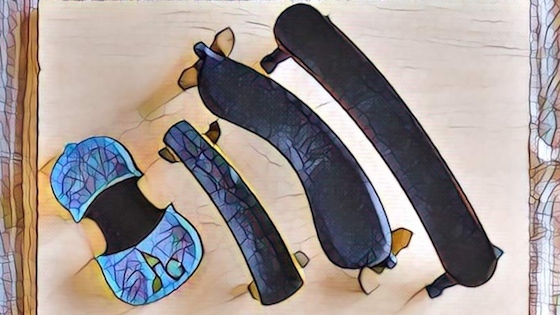 The choice of whether to use a shoulder rest and which one can affect the potential for injury. The most important thing to remember is: don't cause yourself injury, either way. If you are comfortable physically and playing well with a shoulder rest, that is okay. And if you choose play without a shoulder rest, be sure you (and your teacher) understand the type of specific physical adjustments you need to make to do so without injury. Let use know about your current shoulder rest status, and any thoughts you have about the topic. Did you change over the years? Have you ever experienced an injury that required an adjustment in the way you use or don't use a shoulder rest? November 4, 2016 at 05:37 PM · Anyone who isn't Jasha Heifetz shouldn't want to be like him. I'd rather want to be like myself. November 4, 2016 at 05:47 PM · No shoulder rest. I then tried going without for a while. The drawback was that the insecurity of trying to prevent the neck from sliding down my thumb, resulted in an overly clenched left hand (OK, so that's a struggle for many, even with a SR...). No need to clamp something on to the back of your beautiful instrument, no impingement on the tone (whether real, or imagined...). It utilizes your hand for support, since hands are made to hold things, whereas your neck isn't (well, aside from your head...). Along with the SR/no SR debate is something quite important, that seems to get a lot less "airtime"--having a properly sized chinrest. November 4, 2016 at 06:27 PM · I have tried going without the SR, but it just doesn't feel right for me! November 4, 2016 at 06:50 PM · I started to learn playing violin without a shoulder rest. At that time, my practice sessions were coming to an end with a pain in the back of my neck. My teacher was also warning me about the overall condition of my neck and hand movements. But as soon as I started to check my overall posture during the training in the mirror, I found out the reason was my somehow over-long neck. I couldn't compensate for it with a small piece of cloth tucked under the violin or a sponge. I started using original Kun which was too short. But Then I switched to Wolf Forte Secondo, and here I am. Playing with wolf shoulder rest for 8 years. November 4, 2016 at 07:53 PM · One's development is a creative endeavor. I have used a pad, and learned to use none. It's a choice for one's individual needs. I think I really like the expression non pad players achieve from the past and present. Erik Friedman had a beautiful unique sound as does Milstein protégé Dylana Jensen, and also Leila Josefowicz. I think dealing with strain is not avoidable, and solutions are quite varied. November 4, 2016 at 07:57 PM · Have always used a shoulder rest. Went through a couple until I found the perfect one, Comfort Violin Shoulder cradle. Don't think I could play without it. November 4, 2016 at 08:01 PM · I started with a shoulder rest, as a child. All the way through Royal Academy, London, I continued to use one. Graduated from RAM then had a summer of lessons with Helen Dowling (from NY) During my first couple of lessons, she told me to get rid of it. I changed my chin rest, practised loads of Sevcik, fell apart, then rebuilt, with new LH technique, which has served me well in the ensuing years. November 4, 2016 at 08:03 PM · It depends on your neck length and depth of chin rest. November 4, 2016 at 08:10 PM · I used a sponge at the beginning, and then switched to an SR. I have tested many kinds, though. I definitely need a shoulder rest. I do go without one for short periods of time, mostly for testing-new-violin purposes. November 4, 2016 at 08:27 PM · I stopped using one fifteen years ago, but my setup works for me. In the past decade, I've only had one of many dozens of private students who have opted to play in the same manner. For many of my students, a properly-fitted shoulder rest has made violin and viola playing much more accessible. 1) It's entirely a personal choice, as Laurie said, because each of us has different body and we have to respect the differences we have here. 2) This follows that it's a fallacy to argue that so-and-so great violinist uses a SR or not is a reason for us to choose one way or the other -- we are not them. 3) Health concern is paramount -- if it hurts, don't do it. 4) The playing technique is different with or w/o SR so if initial trial doesn't feel good, doesn't mean it's not good for you. 5) One thing I like to compare is difference in sound production. I can feel the violin vibrating better without SR, but does it mean my violin sounds better? Not sure. Ray Chen told us that he used to play without SR and he is now designing one even though his playing technique stays the same. Of course, Ray Chen can do anything he wants and will sound great. But why he switched? He told us that he wants to protect the violin to avoid rubbing the violin on the shoulder. November 4, 2016 at 09:01 PM · I played "restless" for 12 years as a child. My teacher did not allow the shoulder rest. I have seen pictures of myself playing the violin as a child. My posture and setup were absolutely abominable. I always struggled with pain in my jaw and collarbone, and with fatigue from holding up my violin. Then when I was about 12 yo, I met another (female) student of the same teacher, and she used a shoulder rest. Everywhere I went (pit orchestras, etc.) other violinists asked me why I didn't have one. When I left for college I gave up the violin -- for 25 years. When I started again several years back, I bought a Kun because that is what my daughter's teacher (who became my teacher too) recommended it to her. What a difference. Ahh, it felt so comfy to play the violin suddenly, I could practice for hours, if I had the time. (My new teacher also taught me how to listen to "resonances" to calibrate my intonation, something that my childhood teacher also did not teach me -- not in 12 years.) A few things I do remember about my childhood teacher were that he was a friendly and funny guy, a very very good violinist himself, and a worshiper of Heifetz. I am grateful to him for teaching me schmaltz. November 4, 2016 at 09:42 PM · I played for the better part of 20 years without a rest. Then my employment limited the time I could play and I was not playing a lot for about a decade due to high travel requirements of my job at Bell Labs (and they had so many in-house musicians who played together but I was rarely in the office). Once I retired from BL I got back to regular playing and then started having neck and shoulder pains. I got a rest and haven't stopped using it and the neck and shoulder pains are all in the past. November 4, 2016 at 10:15 PM · I use a shoulder rest. I started without a rest as a kid in elementary school and played that way till nearly 19 y/o. Then I tried a few models for comparison and liked the feel of playing with the SR better than without. Since I play daily on three fiddles, I know from experience that the same SR won't work equally well for all three. On one, the Kun Bravo has been ideal for 10+ years. On the other two, the VLM Diamond is better. With my build, I set both at SW-NE position on the back of the fiddle -- lowest point on shoulder side and ¼-inch to ½-inch higher on chest side. Echoing a previous poster: The chinrest does, indeed, get less airtime. But it's so important -- size and height. If you’re uncomfortable, check out your CR and compare some other models. I use Strad Pads on all of mine -- more secure grip and no skin irritation here, even after playing 3 hours a day. November 4, 2016 at 10:54 PM · For carbon fiber Mezzo-Forte violin I need Acousta Grip....doesn't slip off and stays on violin when I put it in it's GL case....squeeses down and adds to suspension protection. All other shoulder rests fall off. November 4, 2016 at 10:54 PM · I agree with Jim Hastings about the CR. In some ways it's harder to get those to fit right because they're so fixed and rigid. I finally settled on the Kaufmann CR, but I carved away part of the wood that was intersecting my jawbone in an uncomfortable way. If I set my violin carefully on my shoulder and lower my jaw into the CR securely at the outset, then I can maintain good comfort, reach things well with my hands, and minimize the hickey (which I call "the mark of the covenant"). November 4, 2016 at 11:19 PM · Both. I learned on a 14th inch viola without a shoulder rest. It was later as an adult on violin that I started using one. Sometimes I do use one and sometimes I don't. It also varies with violin or viola and the music I'm playing. And I don't always stick my jaw in the chin rest. I rest it on my shoulder/collarbone and left hand without squeezing anything. And when I use it, I don't always put it in the same place on the instrument. Had a student with a very short neck and trying to use a shoulder rest did not work for him at all on viola. My vote is try it and see - does it work for you or not work for you. Does it work part of the time, does it vary with the music - with the clothes that you're wearing - does the instrument slide all over or stay put. Why should it be such an issue? A tempest in a teapot. November 4, 2016 at 11:43 PM · I use a chin rest and a pad of chamois, as shoulder rests get in the way of my feeling the violin through my collarbone and jaw, which lower my contact and intimacy with the instrument. November 5, 2016 at 12:32 AM · I once rested my violin on my collarbone and, without making any effort to grip it with my chin, I rested the scroll on a postage scale. The readout was 6.5 ounces. Given that the average adult male and female hands weigh 20 and 18oz respectively, and then there's the forearm etc., the weight of the violin on the left hand is not really very significant. So, since the left hand and thumb have to be there anyway to provide an opposing force to the fingers stopping the strings, it's really not about holding up the weight of the violin as much as it's just about steadying the instrument. So with or without a shoulder rest, the left hand should be doing most of the work, and the chin is ideally very relaxed. That's my opinion, anyway. November 5, 2016 at 01:07 AM · Heifetz of course was not the sole exponent of not using a shoulder rest; it should be remembered that every violinist of his era and before, going back into the mists of antiquity, played without a shoulder rest because then it was the natural and obvious thing to do. Any discomfort or the need to accommodate a particular anatomy would doubtless have been addressed by using a pad or cloth, even a turned-over coat lapel. We know who invented the chin rest in 1820. It was the violinist, composer and teacher Louis Spohr. Why he invented it is not clear, perhaps it was to help a pupil with difficulties to speed up their progress. Who knows? In any event, over the next few decades the chin rest came into common use by everybody. However, what is not so easy to determine is how the shoulder rest came to be invented, why was it invented (inventions often address deficiencies in the current state of a technical art or to meet a perceived need), who was the primary inventor, and when was it invented. There are those of us who can remember shoulder rests coming into use in the early 1950s (so the invention was a little before) , and then spreading like wildfire within a remarkably short space of time - professional marketing helped along by a few influential teachers and performers behind it, I shouldn't be surprised. November 5, 2016 at 01:30 AM · I don't use a shoulder rest. I started w.o. one, then used various types for a number of years. Finally, in the course of a very brief study with Aaron Rosand I learned how not to use one. I've gone into the pros and cons enough in the past and won't rehash them here. Speaking of which, Rosand's arguably top pupil, Ray Chen, as I heard his explanation, said that generally speaking, he still recommends not using a SR but that in the case of his particular Strad it seemed to project better off the shoulder and he invented a special SR for it. What I use is a suede cloth in 3 segments. I use it like I might use a hankie but the suede has slip-resistant qualities. With this simple, thin and flexible device, I'm comfortable and secure and I can down-shift with almost zero pressure from my chin. The top segment goes over the chinrest, giving a lot of comfort, the bottom segment goes around the back, and the middle segment, with the smallest bit of thin foam sewn in lands on the collar bone. It can easily be reversed and turned around in case it gets at all damp from perspiration over the course of playing. I call it my "concert shmatta" (Yiddish for rag)! I've thought to try to market it but I don't think it would be cost-effective. So get cracking and make your own! November 5, 2016 at 01:38 AM · The problem with NOT using a shoulder rest is that very few teachers know how to teach students how to play without one. At least that is the problem in my part of the world. I have never come across a teacher who does not use one. As pointed out above : just because it feels uncomfortable playing without a SR does not mean that way of playing is not for you. It just means you have not been taught how to play without a SR. I use a SR and I do not like using it but I have to ; I cannot do vibrato without it. "I think that the need to keep bringing it (the SR issue) up here, pro or con, is some kind of mass OCD or something. It rarely comes up in a professional gig setting." "Rest, shmest - as long as you have your health!" November 5, 2016 at 02:52 AM · @Brian: Yup! November 5, 2016 at 02:56 AM · I currently don't use a shoulder rest, but I used to. I started with one, but when I had been playing about a year, it got uncomfortable, and no matter how I adjusted it or fixed it or set it down for a few minutes, I could not get it right. And it lasted for a couple of weeks… not having a teacher at the time, I googled what I should do about it. I then ran into the Great Violinist's Debate over SRs. Over the next year or so, I went back and forth between play with one and w/o one, playing with a rag over my chin rest, or around my shoulder rest; which at the time I was using a Wolf Forte, I think, but the rubber it was made of started to irritate my skin and give me an itchy rash until like, 20 minutes after I stopped playing. I also got a new chin rest that fit me a little better, and it was also a little higher. Then I read an article on here, and it encouraged me to try to go without a rest again, but this time, rather than doing it like I used to, "Quick take it off, play a scale, quick put it back on, quick take it off again" kind of thing, I desided to stick to it for one month, and I wouldn't play with one on that whole month. I think I made it three weeks before I put it back on, but just to compare. It felt so heavy and awkward, distant and cold, like it wasn't even the same instrument I had played before. It was so stiff, and it felt like I couldn't reach the higher positions without going in circles like a dog chasing its tail trying to overcome my shoulder rest. But support was hard, too. I started positioning my thumb the way Anne-Sophie Mutter does: she kind of points her thumb behind her, and rather than rest the neck in the grove between first finger and the thumb like Perlman and Oistrakh, she sets it on top of the pad of her thumb. Doing it this way helps with shifting, and it reduces my chance to clamp the neck. But when you get in the habit of doing this, and then you put the shoulder rest back on, it's nearly impossible! And you can't feel the notes from the violin go into your shoulder and down your arm and back into the music. It feels like loosing a deep connection you once had. November 5, 2016 at 08:02 AM · I played with a shoulder rest for 30 years. I now have a catheter above my heart to deliver chemo therapy for non invasive breast cancer and it causes discomfort to play with a shoulder rest. I stopped over night and have really not missed it. True my left had technique needs adjusting but I feel better whilst playing and I appreciate the tips above. November 5, 2016 at 01:49 PM · A.O., I cannot agree with your contention that the chin props up the violin. I'm assuming here that a shoulder rest is not used. The function of chin contact is to provide just enough friction to stabilise the violin during shifts, particularly down-shifts. The relaxed movement (no gripping!) of the left hand along the neck should be as smooth as possible with minimum friction (which is why the neck is never varnished), so the chin contact friction is only slightly more. Whether the chin contact is by way of a chin rest or otherwise, is not important. All of this requires that the violin rests on the collar-bone, with or without the intervention of clothing, and that the scroll is on a level with the centre of the player's face (i.e. the major axis of the violin is horizontal). Playing the violin without shoulder and chin rest in this way works for me. Fwiw, this week I've had three rehearsals with three orchestras, the programmes including Schubert 9, Mozart 25 and 35, Mendelssohn 3, Borodin 2, Tchaik's Romeo and Juliet Overture, and a couple of concertos, with no problems. Regarding US politics, all I can say from my perspective in the UK is "Come back, Peter Florrick, all is forgiven!". In the UK we have our own latest problem in the attempt to split from the EU - yesterday, the High Court threw a large procedural spanner into the works, causing uproar. November 5, 2016 at 02:25 PM · Sorry, I always use the incorrect word that is "prop". What I mean is that players like Ernst or Sarsate used light and relaxed pressure with the chin, but that their anatomy held the violin more or less level with their face, whereas lack of it drops the naked violin very far down, which inhibits playing anything after the Classical Period very fluidly(because you must constantly support most of the violin's weight, resulting in slow/crawl shifts. November 5, 2016 at 03:18 PM · Have played for 22 years and am a professional violinist and teacher. Tried lots of different shoulder pads/rests: Resonans, Kun, Wolf, blue wedge sponge, cosmetic sponges, basically you name it, I've probably got it sitting in my closet somewhere. Around 6 years ago I had a stand partner who had the same body type as me and whose playing I really admired. I asked him about his shoulder rest and he let me try it out. I immediately bought one the next day and still am using it now. Since then, I've had no neck pain, shoulder pain, or really any pain at all. Of course I still have fatigue after a long rehearsal or performance, but never any pain. So the shoulder rest that works for me is the Kun Bravo with the legs all the way up (so, the shortest that it can go). I even lost a little over 100 lbs since then and the shoulder rest still is perfectly. Makes me think that a person's ideal shoulder pad probably has more to do with bone structure and neck length than anything else. I recommend that all my students try out a bunch of different shoulder pads (including nothing at all) and pick the one that feels the most comfortable. November 5, 2016 at 03:22 PM · AND NOW, FOR SOMETHING DIFFERENT: I studied with an old Bflo philharmonic 1st fiddler who swore that one of his section adversaries played with no shoulder rest but had all his sport coats and tux jackets tailored with built-up left shoulder pads...and when entering or leaving the stage, he walked a tilt to compensate for the bulge.....not sure what he wore to practice at home, but he also added that it was a common practice among soloists of the time (1950-62). November 5, 2016 at 03:29 PM · Mark, good point on relaxing the chin but regarding the weight, you didnt mention the extra weight the violin gets when it's bowed. Sometimes my right arm can feel quite weighty when I try to pull some meaty sound. There must be some downward pressuere even though the bow moves mostly lateral. November 5, 2016 at 04:06 PM · I played for years with an SR but gave it up 18 years ago. It did require the support of a teacher who knew how to play without SR. I would not have been able to make the transition without his help. It also took time. The technical changes helped propel me across a long plateau in my technical development. In any event, I think that the major discussion is not SR or no-SR but clench versus no-clench. Clenching the violin at the chin and shoulder is not sustainable and is sure to lead to pain. November 5, 2016 at 04:31 PM · When I picked up my violin as an adult my teacher persuaded me to go without one, and I played without one for several years. Unfortunately MS has made playing without one more difficult so I now use one. November 5, 2016 at 07:29 PM · Regarding weight loss with the shoulder rest, people don't typically accumulate fat on the tops of their shoulders but men do tend to get jowly when they're overweight -- I am speaking from experience, unfortunately. However this flesh is particularly moveable so I would not expect you to have to change your setup unless you got liposuction on your double-chin(s) or something drastic like that. November 5, 2016 at 07:29 PM · Sorry, double post. November 5, 2016 at 08:47 PM · I didn't vote because I wasn't sure if my homemade shoulder pad counts as a shoulder rest or not. November 6, 2016 at 02:00 PM · ML Scott, unless the metal hardware of your chinrest is digging a permanent bruise into your collarbone (as mine did when I was a child, I have a bone spur to show for it now), then I'm sorry to say, you're just another miserable shoulder-rester and there will be no place in Heifetz Heaven for you. The amount of people that can actually go completely free are a minute number with Perlman physique (and even he uses a sponge), or those with a very well fit (custom?) chinrest. November 6, 2016 at 05:15 PM · My goal has always been to play without a SR. I mostly use a sponge in performance to avoid slippage and to have a softer interface with the instrument, but I do enjoy practicing with nothing for the most part. I am quite tall and have a significant neck distance, still I am able to do most everything without pain and clutching. As a pedagogue I am most interested in how the thumb functions in the left hand and practicing without a SR gives me more insight into shifting and the mechanics of shifting. While this has been a lifetime journey for me I enjoy such investigation and have noticed how my technical and expressive choices are quite different when I have used or not used a SR. While originally it was a somewhat philosophical decision on its use, today it is simply wanting to have the lightest weight on my shoulder with the most possible movement and flexibility. Also I like picking the instrument out of the case and playing. Silly perhaps but satisfying. I have never forced my students to go either way but have noticed that I have generally liked the musical outcome more of the students who use less add on support. It seems that they have more the desire to lift the head from the violin at times and are more comfortable with supporting the violin in the hand when desired or musically desired. November 7, 2016 at 08:34 AM · As a Morris Musician (playing Folk), the majority of what i play is outside. So it could be in a Beer Tent, outside a Pub, sitting down or standing or leaning against a Lamp Post or a Fence. Personally, it gives me more freedom of movement without a Shoulder Rest. I have tried both as some other Morris Musicians do have a Shoulder Rest. So for me personally, i prefer playing Fiddle without one. November 7, 2016 at 08:09 PM · I'll chime in, I have always used a shoulder rest of some kind. The number one thing that it affects is your position and thus your physical comfort and potential for injury, and so that is the number one reason to either play with or without one: avoiding injury and playing with comfort. I do not buy the argument that using one or not using one somehow empirically makes you have a better sound or play better! November 9, 2016 at 12:53 AM · I don't use SR. I don't have a short neck and am happy playing in a t-shirt. I hold up the violin with my left hand. It works for me. I used to use a SR, and at one time owned all the different brands on the market in an attempt to get comfortable. I eventually realised that the SR, again I stress for me, was not the solution to being comfortable. I only learnt to play without discomfort when I got rid of the SR altogether. November 10, 2016 at 01:49 PM · I used a SR for years, but changed over to a shoulder pad (a piece of foam) for ten years or more, then got rid of that, too. It was a major reorientation. In my case, I am aware that it took a long, long time for my habits, and muscles to change. When I got rid of the foam pad, my vibrato went right out the window. I remember being very uncomfortable--being too afraid I would drop the instrument. With work, everything came back. I am now completely comfortable playing without a SR and never give it any thought. It really is a matter of retraining your muscles, plus having the right physical type. I was inspired to do it by going to a Nathan Milstein recital with a front row seat (literally). I spent two hours watching this man, whose height and build were identical to mine, playing along with air between his shoulder and the fiddle. It showed me it could be done easily and that it was muscles and training. Whether someone with a small build or a long neck could do it, I don't know. The advantage is simple and obvious. No shoulder rest to break or come loose. Ironically, with a viola I have to use a support just because of the greater weight. I can play a viola well without any pad or rest, but after thirty minutes or so I start to feel soreness and tension in the neck. Discretion (avoiding an over-use injury) is enough to get me to use a support.